Paula Heldt, academic services coordinator, was presented with the Administrator Excellence Award on May 7. Since joining the University of Evansville in 2000, Paula has shown her support and kindness to students and coworkers. Her unending energy and enthusiasm has served UE in the Freshman Edge Program, and the coordination of May and December commencement ceremonies and Freshman Convocation. Paula recently spearheaded the inaugural programming of the study skills/time management services offered to UE students. Her work on all of these projects was done in addition to her responsibilities in the Office of Academic Affairs. Paula is known to go the extra mile every day in everything she does, whether it is working with students, their parents, faculty, staff, or administrators, you can count on Paula to find a solution and carry it out with a smile. The University begins a modified summer schedule today. It will continue through August 8. Business hours for the campus will be adjusted during this period to 8:00 a.m. to 4:30 p.m. As always, the area supervisor is responsible for the scheduling decisions that will best meet the University’s and their respective department’s service requirements. We will return to regular hours on Monday, August 8. Farewell reception for Linda Bathon planned for today! Please join the Center for Academic Advising in wishing Linda Bathon, director of academic student services and the Writing Center, farewell on Tuesday, May 10, from 2:00-4:00 p.m. We wish to thank her for 22 years of service to the University of Evansville. The reception will be held in Room 264 in the Clifford Memorial Library. Employee health screenings will be held June 7-9 from 7:00–11:00 a.m. in UE Medical Clinic. Employees who are enrolled in the HRA Insurance Plan are eligible to attend and receive HRA credits. Employees can only schedule their appointments for the health screenings on AceLink. An employee can schedule up to two appointments (employee and spouse) when they sign in to AceLink. An 8-hour fast is required, and a 12-hour fast is recommended because triglycerides are included with the blood fat/cholesterol testing. Hydration is important when fasting. Water and black coffee are allowed prior to testing. The eleventh annual Midwest Dragon Boat Race will be held on Saturday, June 4, at Deaconess Sports Park Lake. Join the UE team! No skills necessary and anyone can participate. Lunch and a team shirt will be provided. Contact la87@evansville.edu for more information or to sign up. Extra copies of the 2015 LinC are still available to those who would like a copy. Just stop by Student Publications on the second floor of Ridgway University Center and pick up a copy from the box located outside the door. UE's Department of Mathematics has announced the creation of a degree program in Statistics and Data Science. Students in the program will apply statistical and computational techniques to convert vast amounts of data into actionable insights that drive decision making. Students may enroll now, and classes are set to begin in the fall of 2016. The digital revolution has created vast amounts of data. Extracting meaning from this avalanche of information is the goal of data science, a rapidly growing field that is revolutionizing marketing, education, and sports, as well as scientific fields such as genomics, neuroscience, and particle physics. There is currently a global data scientist talent gap. It is estimated that by 2018, there will be twice as many data scientist jobs as there are data scientists. Extracting meaning from data requires not only quantitative skills such as mathematics, statistics, and computer programming, but also experience in working with real-world data. Starting Monday, May 9, Open Swim will be Monday - Thursday from noon- 2:00 p.m., depending on guard availability. The employees of the University of Evansville are again invited to play golf with other UE employees on Thursday afternoons during the summer months. The UE golf outings will start on Thursday, May 12 at 3:00 p.m. The first two weeks will be played at Thunderbolt Pass, and the following weeks will be played at Fendrich and McDonald's golf courses. You can reserve your tee time by contacting Debbie Kassenbrock in the Center for Academic Advising at dk26@evansville.edu by noon on the Wednesday prior to the outing. The library's summer schedule starts Thursday, May 5, and ends on Tuesday, August 23. We are open Monday-Friday, from 8:00 a.m.-5:00 p.m., when classes are not in session. From May 16–July 22 during Summer I and II, the library is open Monday-Thursday, from 7:45 a.m.–8:00 p.m. and Friday from 7:45 a.m.–5:00 p.m. The library will be closed weekends and holidays. Please direct questions to Meg Atwater-Singer at 812-488-2487 or ma35@evansville.edu. 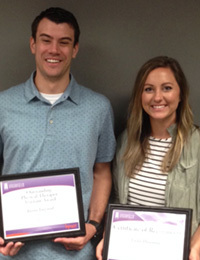 Physical therapy assistant students Justin Jargstorf and Taylor Hasenour recently received awards. Justin was awarded the 2016 Outstanding Physical Therapist Assistant Award for academic achievement, clinical performance, and leadership. Taylor received the award for 2016 Outstanding Clinical Performance. Three runs crossed the plate in the bottom of the fifth inning as Loyola came from behind to defeat the University of Evansville Softball team, 4-3, in Sunday’s regular season finale. The Purple Aces finish the regular season with a 24-25 mark and 12-14 in the Missouri Valley Conference. The 12 victories in conference play marks the most since the 2007 campaign when UE also had 12 wins. Taking the sixth seed, UE has clinched its best MVC finish since taking the same spot in the 2008 campaign. This weekend also capped off an unbelievable turnaround that saw the squad more than double its wins from a season ago. UE will be the number sixth seed for the MVC Tournament and is set to face number seven Illinois State in the first round on Thursday at 1:34 p.m. This year’s tournament is being hosted by Southern Illinois in Carbondale. "When we met at the start of the season we talked about our goals; our number one goal was to go out and compete. I think we did that in every game we played this regular season,” UE head coach Mat Mundell said. "To go from 10 wins to 24 is a testament to the girls buying in to what we're are trying to build here in Evansville. I think we have changed a lot of opinions about Purple Aces Softball." Morgan Florey registered three hits as Evansville’s designated player on Sunday. She also recorded an RBI and scored once. Courtney Land and Hayli Scott posted two hits apiece. Land notched an RBI while Morgan Lambert knocked in the other UE run. In the circle, Emily Lockhart threw the full six innings. Just one of Loyola’s four runs were earned. Evansville got to work very fast in the first inning as Land and Florey each notched one-out singles. That brought Lambert to the plate, who singled to center to give UE a 1-0 lead. After the Ramblers (21-18, 5-19 MVC) tied it up in the second, the game went scoreless until the top of the fifth. That is when Florey hit her eighth home run of the season to put the Aces back on top. The difference in the contest game in the Ramblers’ half of the fifth as a triple off the bat of Katy LaCivita saw two runs score. They added one more to take a 4-2 lead. The Aces scored in the top of the seventh on a Land home run, but Loyola closed out the game and the 4-3 win. Jonathan Ramon has enjoyed a career season with the University of Evansville Baseball team, and the plaudits have started to roll in for the senior as he was named to the Academic All-District 5 team, as selected by the College Sports Information Directors of America. Ramon, a sport communications major, owns a 3.42 grade point average, but his accomplishments on the diamond have been just as impressive. The Jackson Heights, New York, native has hit 10 home runs so far this season, which is the single best total for an Aces player since 2010, which was the last year under the old NCAA bat standards. He enters this weekend’s series at league-leading Dallas Baptist with a .314 batting average and a team-best .614 slugging percentage. Ramon, as well as Missouri State’s Alex Jefferson and Bradley’s Ian Kristan, are the only baseball players from the Missouri Valley Conference to earn a spot on an all-district squad. All district honorees will now be eligible for selection to the CoSIDA Academic All-America teams, which will be announced later this month.